Farming and food production in Australia faces growing threats from 'emergency animal disease' (EAD), defined as any exotic or endemic disease which if an outbreak occurred would have a national impact and/or affect market access. Government agencies and farming organisations play a crucial role in communicating information to farmers about how emergency disease threats should be recognised, reported and managed. Yet, little is currently known about how farmers obtain information on EAD, the ways in which they understand and manage disease risks, and whether current communication strategies are effective in improving farmer understanding and knowledge of how to deal with disease threats. These gaps in knowledge have been addressed in a CSU research project involving an inter-disciplinary team of researchers. The 18 month project aimed to provide a comparative understanding of how beef producers in Australia's Northern and Southern beef zones recognise and manage emergency animal disease, and to determine the most efficient and effective strategies for communicating with them to improve disease recognition, reporting and management. 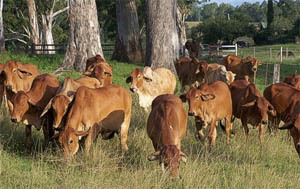 The project involved a review of existing policy documents and reports, a survey of beef producers in the Burdekin region of Queensland and the Riverina region of New South Wales, semi-structured interviews with a smaller sample of beef producers in each region, as well as interviews with government and industry stakeholders. Higgins, V., Bryant, M., Hernández-Jover, M., Rast, L. and McShane, C. (2016) Devolved responsibility and on-farm biosecurity: practices of biosecure farming care in livestock production, Sociologia Ruralis. DOI: 10.1111/soru.12155. A final project report submitted to the Department of Agriculture in November 2014. A presentation at the European Society for Rural Sociology Congress held in Florence, July 29 to August 1, 2013. The presentation focused on the institutional and organisational challenges that influence how strategies for dealing with disease risk are developed and implemented. A presentation at the Australasian Agri-Food Research Network Conference held in Sydney, November 24-26, 2014. The presentation focused on the issues and challenges involved in improving coordination among Australian government agencies and organisations responsible for dealing with EAD. A paper is currently being prepared from this presentation and will be submitted to an international journal in early 2015. The findings from the project raise two significant issues that form the basis of the project team's recommendations to the Department of Agriculture. The first issue relates to the need for better coordination and collaboration between stakeholder organisations. This is necessary to encourage a shared understanding of biosecurity and EAD and to communicate a consistent message to producers about the importance of EAD prevention. The second issue relates to improving producer awareness of the importance of EAD prevention as well as the roles that each stakeholder organisation plays within the broader animal health system. This involves better targeting of communication about the roles of stakeholders as well as practical information about on-farm biosecurity.